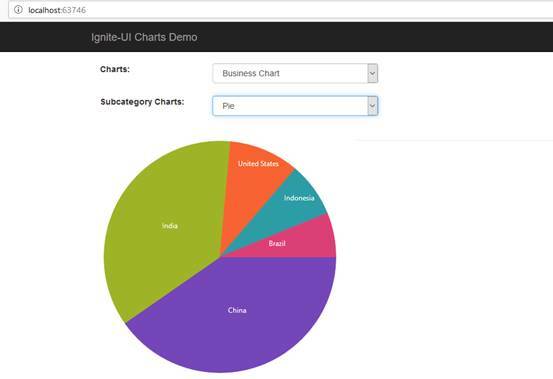 In this article, you will learn to represent Data using Ignite UI jQuery Charts with MVC. In enterprise applications, our focus is on the representation of data in the form of information. Visual elements are the best way to represent data so that data can be easy to understand. The objective of the business application is to turn data into data analysis so that top authorities can make some important decisions. The best way is data visualization charts. Unfortunately, there are not enough built-in controls in MVC that give the best pictorial representation of data. However, there are several third-party component vendors that provide rich chart data controls and one of those component vendors is Infragistics. Also make sure your project includes “jquery-1.11.3.js”, “modernizr-2.8.3.js”, and “jquery-ui” (1.11.1) and above versions if not please add the following scripting links. Now, add a new controller named “ChartsController.cs” also add a view named “index.cshtml” in “~/views/Charts/” and make it the default controller in “~/App_Start/RouteConfig.cs” file as shown in Listing 3. Add two data models “Chart” and “Charts” in models folder. These data models will represent the main and subcategories of charts as shown in listing 4 and 5. Now, open the ChartsController.cs and the following code. 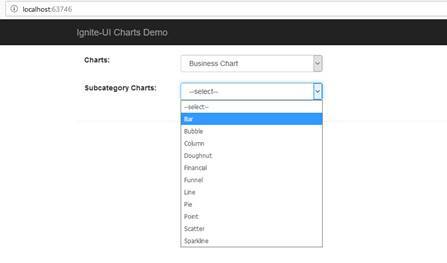 We have a property chart, it will hold the list of charts in ignite ui and in the constructor of ChartsController we are calling the LoadCharts() method that assigns the list of charts as shown in Listing 6. 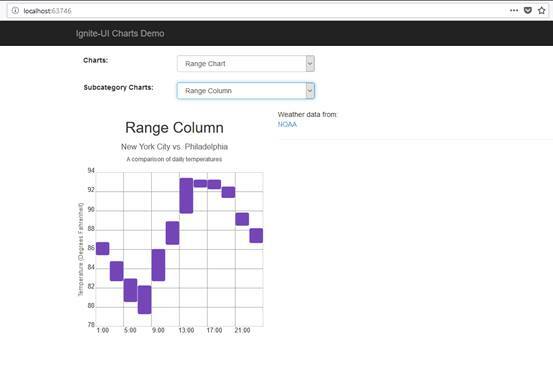 Index() action has a list of charts. 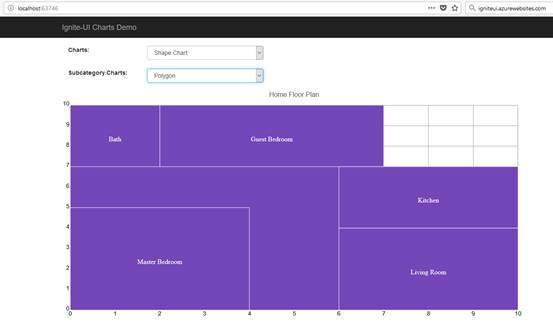 In this charts property, we are constructing another list of charts with the help of this. This list contains the list of SelectListItem class with value and text properties that are going to bind with the drop-down on the view with the help of ViewData as shown in Listing 7. 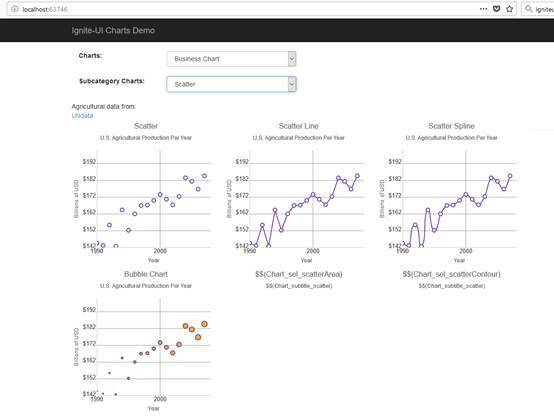 In listing 8, GetSubCategoryCharts() method is taking one argument, CategoryChartId, and returning the list of subcategories of charts. Now, open the view to add two dropdowns controls, one for main chart category and another one for subcategories as shown in Listing 9. 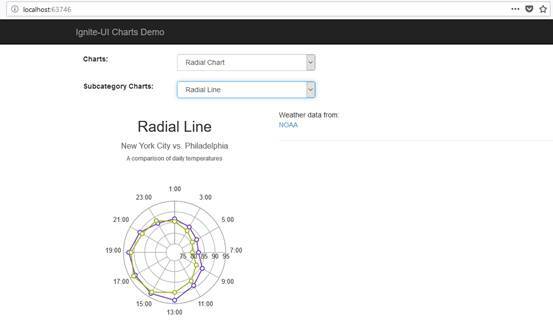 Add a partial view named “~/Views/Shared/_RenderChart.cshtml” in which we can render our chart. Now, build the project and run it in the web browser. 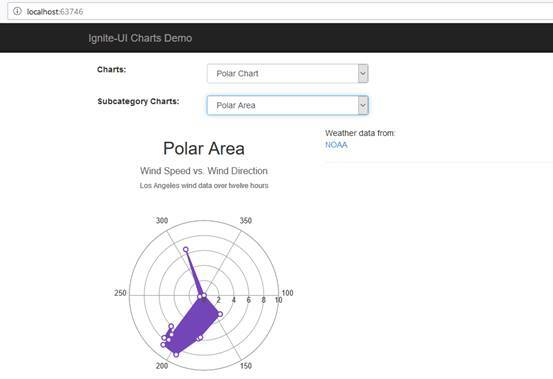 Web user interface is ready to render ignite-ui charts. Let’s add data models which are going to be used as data source for the charts. 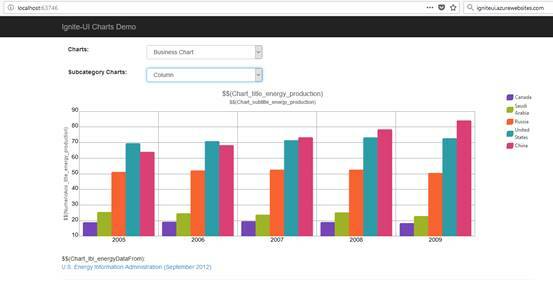 In Listing 10 the “CountryEnergyProductionModel” will represent the year-by-year energy production for five countries. This data model is going to be used in "Stacked Area", "Stacked Bar", "Stacked", "Stacked Line","Stacked Spline","Stacked Spline Area","100 % Stacked Area","100 % Stacked Bar","100 % Stacked Column","100% Stacked Line","100% Stacked Spline","100% Stacked Spline Area","Bar","Column","Line" ,"Point". 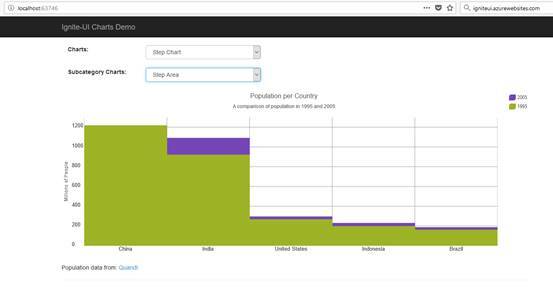 As shown in Listing 11, second data model is “CountryPopulationModel” which represents the country-wise population growth for 2 years for the following countries: “China”, “India”, “United States”, and “Brazil”; and this data model is going to be used in "Spline", "Spline Area", "Step Area", "Step Line", "Waterfall", "Doughnut", and "Pie". In listing 12, CityTemperatureModel data model represents the counties wise temperature for two cities on a particular date and it shows the variation in temperature every two hours. 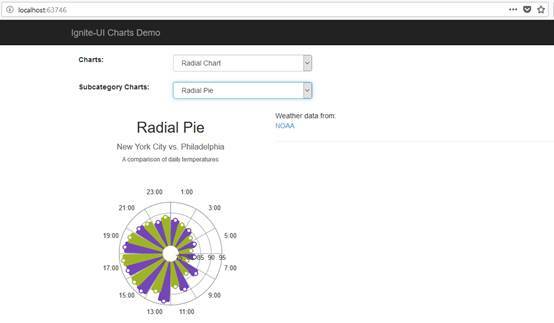 This data model will be used in "Radial Area", "Radial Column", "Radial Line", "Radial Pie", "Range Area", and "Range Column". 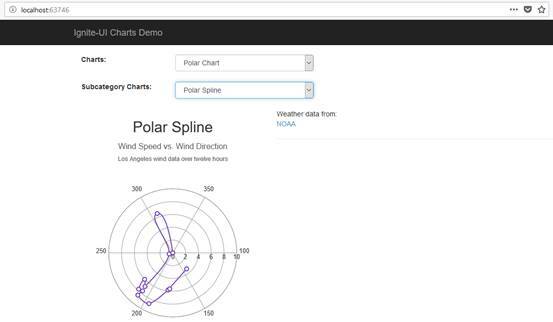 In listing 13, the data model WeatherModel represent the hour wise weather forecast on a particular date, and this data model is used in Polar Area", "Polar Line", "Polar Point", "Polar Spline", and "Polar Spline Area". 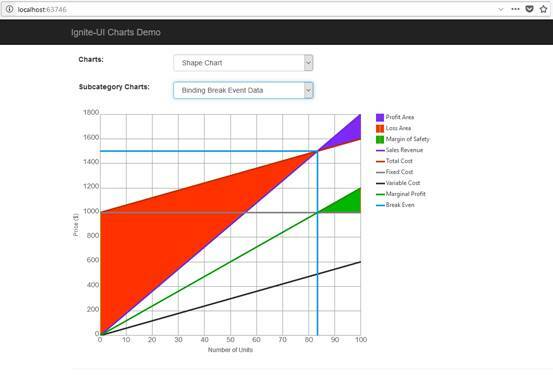 Add the RenderChart action method in ChartsController that will load the partial view _RenderChart.cshtml with charts data model which contains the data property. 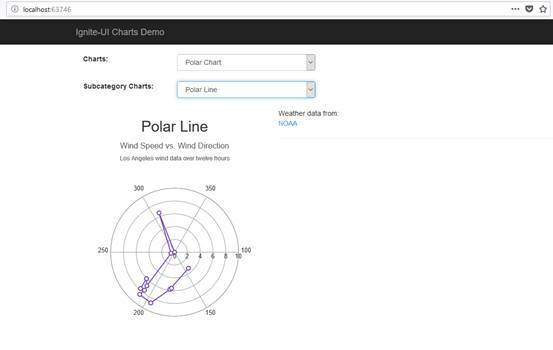 It has JSON formatted data that will plot the chart on the page as shown in listing 16. 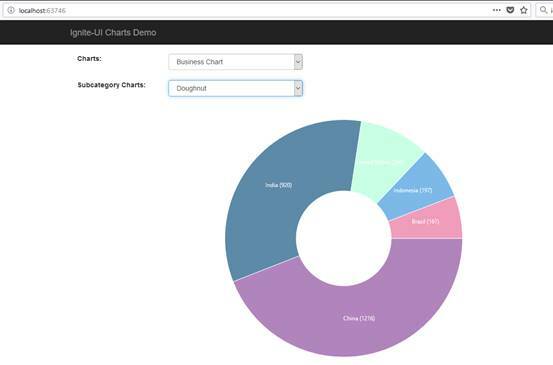 In _RenderCharts.cshtml file add the following code which will render the chart with the data which will be selected in subcategory dropdown list as shown in listing 17. 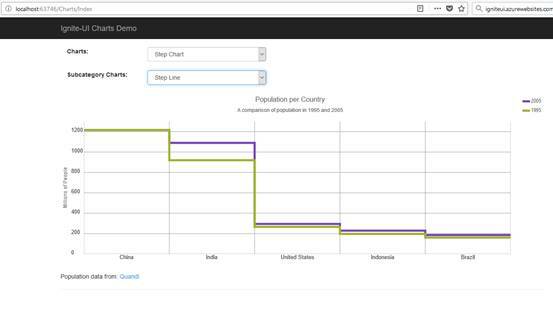 Each chart has HTML and script with the data source property that draws the chart in the web page, and we need to assign the data source for each chart and in the .cshtml page, we have a markup @Html.Raw(Model.Data) which will populate the data source as JSON. 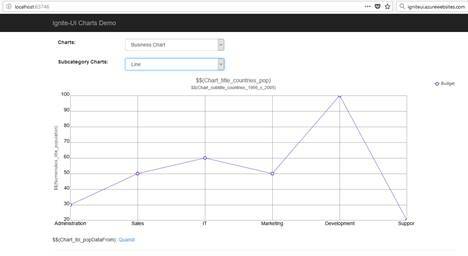 Let’s render the business charts category. To render the bar chart we have added a partial view “~/views/shared/BusinessCharts/_Bar.cshtml” and add the following html in it as shown in Listing 18. To render the bar chart we have added a partial view “~/views/shared/BusinessCharts/_Bubble.cshtml” so add the following HTML in it as shown in Listing 19. To render the bar chart we have added a partial view “~/views/shared/BusinessCharts/_Column.cshtml” so add the following HTML in it as shown in Listing 20. 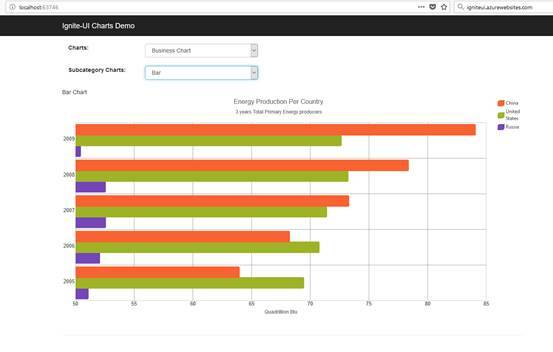 To render the bar chart we have added a partial view “~/views/shared/BusinessCharts/_Doughnut.cshtml” so add the following HTML in it as shown in Listing 21. To render the bar chart we have added a partial view “~/views/shared/BusinessCharts/_Financial.cshtml” so add the following html in it as shown in Listing 22. 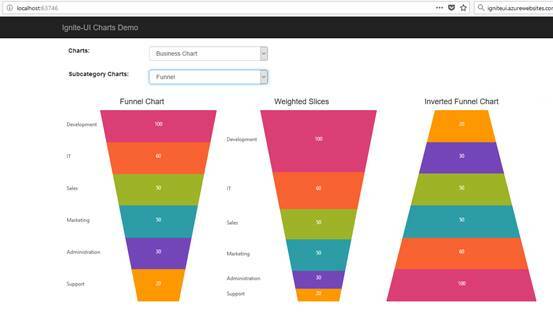 To render the bar chart we have added a partial view “~/views/shared/BusinessCharts/_Funnel.cshtml” so add the following HTML in it as shown in Listing 23. To render the bar chart we have added a partial view “~/views/shared/BusinessCharts/_Line.cshtml” so add the following HTML in it as shown in Listing 24. To render the bar chart we have added a partial view “~/views/shared/BusinessCharts/_Pie.cshtml” so add the following HTML in it as shown in Listing 25. 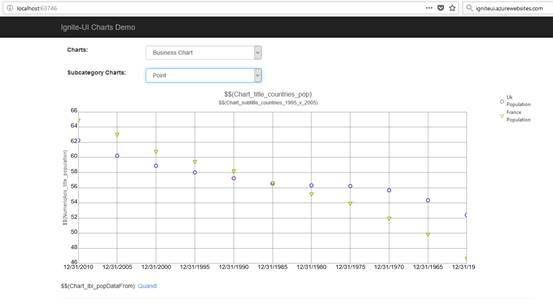 To render the bar chart we have added a partial view “~/views/shared/BusinessCharts/_Point.cshtml” so add the following HTML in it as shown in Listing 26. To render the bar chart we have added a partial view “~/views/shared/BusinessCharts/_Scatter.cshtml” so add the following HTML in it as shown in Listing 27. 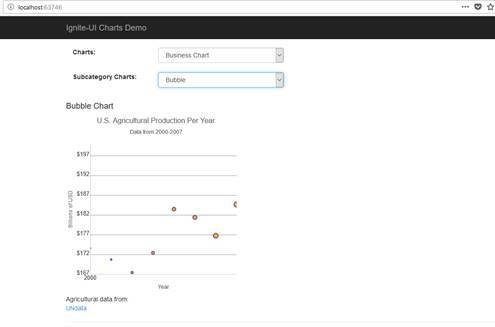 United States Food and Agriculture gross production. To render the bar chart we have added a partial view “~/views/shared/BusinessCharts/_Sparkline.cshtml” so add the following HTML in it as shown in Listing 28. 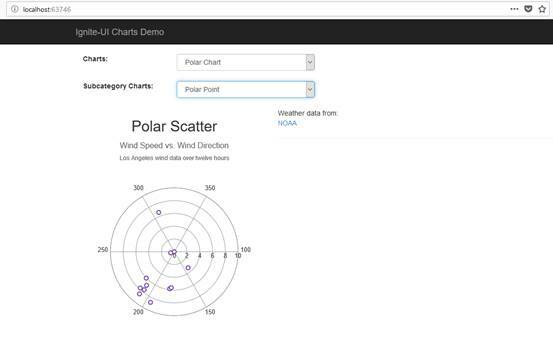 Let’s render the polar charts category. 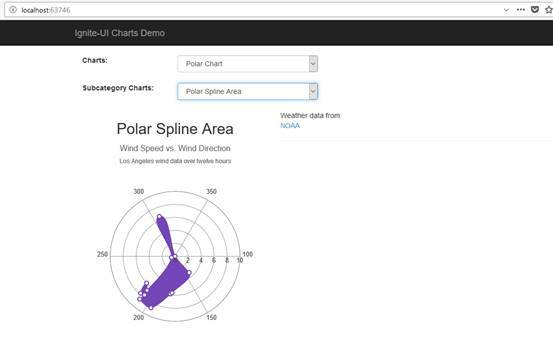 Wind information from Los Angeles weather station. To render the bar chart we have added a partial view “~/views/shared/PolarCharts/_PolarLine.cshtml” so add the following HTML in it as shown in Listing 30. To render the bar chart we have added a partial view “~/views/shared/PolarCharts/_PolarPoint.cshtml” so add the following HTML in it as shown in Listing 31. To render the bar chart we have added a partial view “~/views/shared/PolarCharts/_PolarSpline.cshtml” so add the following HTML in it as shown in Listing 32. To render the bar chart we have added a partial view “~/views/shared/PolarCharts/_PolarSplineArea.cshtml” so add the following HTML in it as shown in Listing 33. 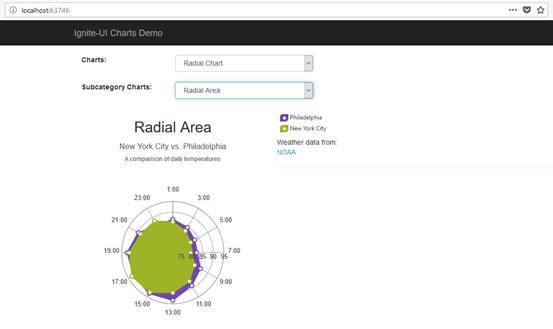 Let’s render the radial charts category. To render the bar chart we have added a partial view “~/views/shared/RadialCharts/_RadialArea.cshtml so add the following HTML in it as shown in Listing 34. To render the bar chart we have added a partial view “~/views/shared/RadialCharts/_RadialColumn.cshtml” so add the following HTML in it as shown in Listing 35. To render the bar chart we have added a partial view “~/views/shared/RadialCharts/_RadialLine.cshtml” so add the following HTML in it as shown in Listing 36. 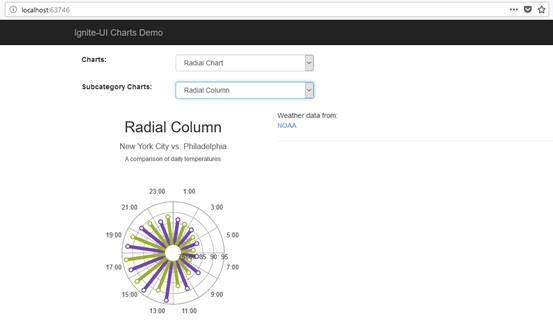 To render the bar chart we have added a partial view “~/views/shared/RadialCharts/_RadialPie.cshtml” so add the following HTML in it as shown in Listing 37. 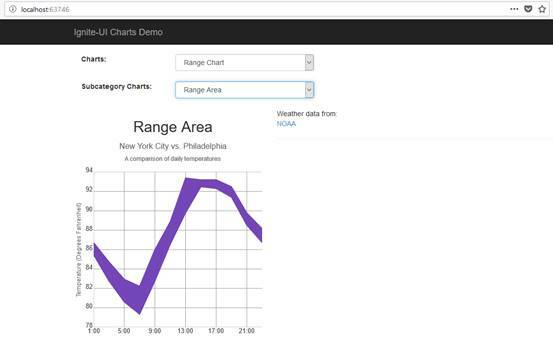 Let’s draw the range category charts. To render the bar chart we have added a partial view “~/views/shared/RangeCharts/_RangeArea.cshtml” so add the following HTML in it as shown in Listing 38. To render the bar chart we have added a partial view “~/views/shared/RangeCharts/_RangeColumn.cshtml” so add the following HTML in it as shown in Listing 39. 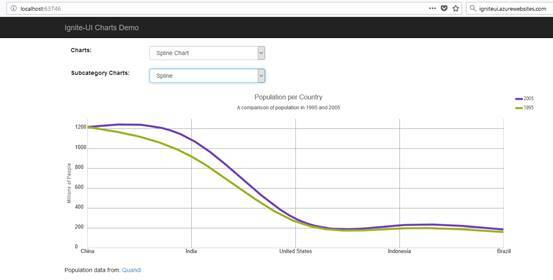 Let’s draw the spline charts category. To render the bar chart we have added a partial view “~/views/shared/SplineCharts/_Spline.cshtml” so add the following HTML in it as shown in Listing 40. To render the bar chart we have added a partial view “~/views/shared/SplineCharts/_SplineArea.cshtml” so add the following HTML in it as shown in Listing 41. 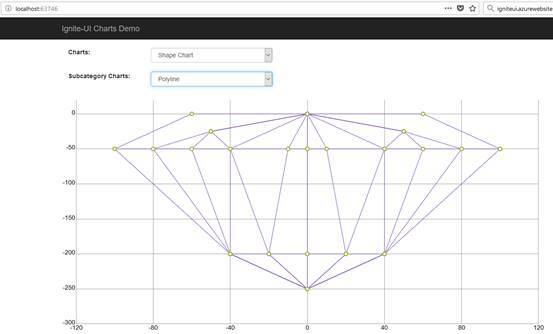 Let’s draw the shape category charts. To render the bar chart we have added a partial view “~/views/shared/ShapeCharts/_BindingBreakEventData.cshtml” so add the following HTML in it as shown in Listing 42. To render the bar chart we have added a partial view “~/views/shared/ShapeCharts/_Polygon.cshtml” so add the following HTML in it as shown in Listing 43. To render the bar chart we have added a partial view “~/views/shared/ShapeCharts/_polyline.cshtml” so add the following HTML in it as shown in Listing 44. Let’s draw the step charts category. To render the bar chart we have added a partial view “~/views/shared/StepCharts/_StepArea.cshtml” so add the following HTML in it as shown in Listing 45. To render the bar chart we have added a partial view “~/views/shared/StepCharts/_StepLine.cshtml” so add the following HTML in it as shown in Listing 46. To render the bar chart we have added a partial view “~/views/shared/StepCharts/_Waterfall.cshtml” so add the following HTML in it as shown in Listing 47. 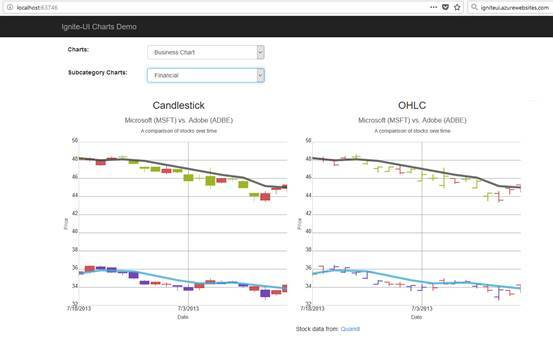 Let’s draw the stacked charts category. To render the bar chart we have added a partial view “~/views/shared/StackedCharts/_StackedArea.cshtml” so add the following HTML in it as shown in Listing 48. 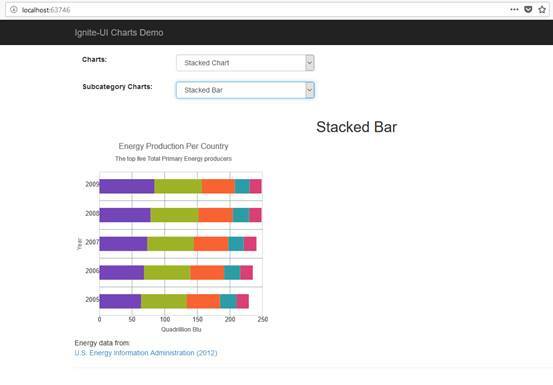 To render the bar chart we have added a partial view “~/views/shared/StackedCharts/_StackedBar.cshtml” so add the following HTML in it as shown in Listing 49. 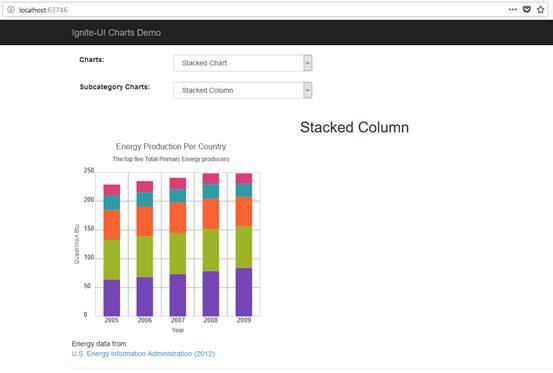 To render the bar chart we have added a partial view “~/views/shared/StackedCharts/_StackedColumn.cshtml” so add the following HTML in it as shown in Listing 50. To render the bar chart we have added a partial view “~/views/shared/StackedCharts/_StackedLine.cshtml” so add the following HTML in it as shown in Listing 51. 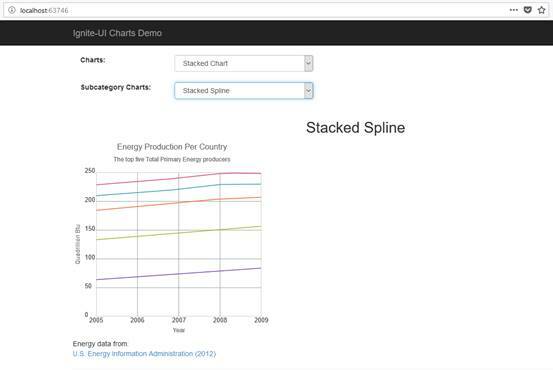 To render the bar chart we have added a partial view “~/views/shared/StackedCharts/_StackedSpline.cshtml” so add the following HTML in it as shown in Listing 52. To render the bar chart we have added a partial view “~/views/shared/StackedCharts/_StackedSplineArea.cshtml” so add the following HTML in it as shown in Listing 53. To render the bar chart we have added a partial view “~/views/shared/StackedCharts/_100StackedArea.cshtml” so add the following HTML in it as shown in Listing 54. 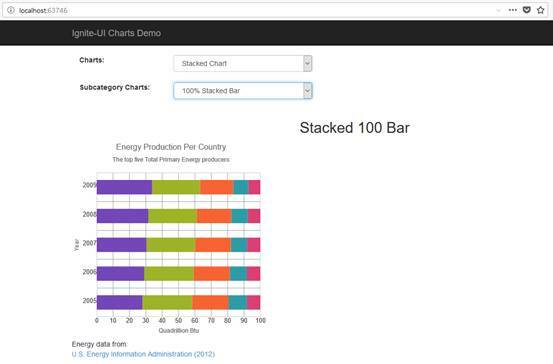 To render the bar chart we have added a partial view “~/views/shared/StackedCharts/_100StackedBar.cshtml” so add the following HTML in it as shown in Listing 55. 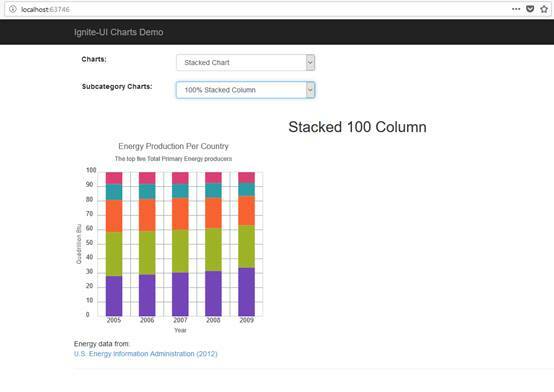 To render the bar chart we have added a partial view “~/views/shared/StackedCharts/_100StackedColumn.cshtml” so add the following HTML in it as shown in Listing 56. 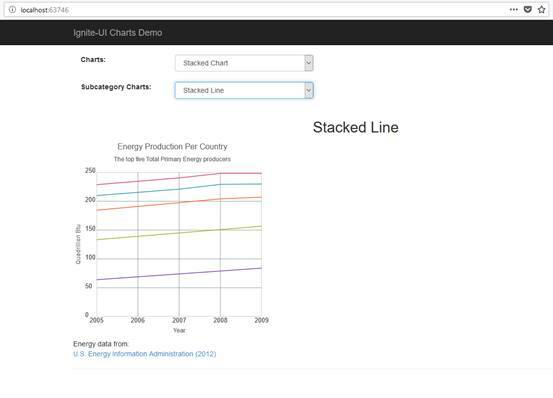 To render the bar chart we have added a partial view “~/views/shared/StackedCharts/_100StackedLine.cshtml” so add the following HTML in it as shown in Listing 57.